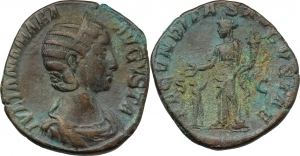 Lot 19585 - Julia Mamaea, mother of Severus Alexander (died 235 AD.). AE Sestertius. Obv. IVLIA MAMAEA AVGVSTA. Diademed and draped bust right. Rev. FECVNDITAS AVGVSTAE SC. Fecunditas standing left, holding cornucopiae and extending hand to child. RIC 668. AE. g. 15.80 mm. 29.00 Green-brown patina. Good VF.